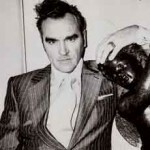 If you followed The Smiths, you’ll be more than happy to know that Steven Patrick Morrissey..or, Morrissey/Moz , to his fan base, is on tour and due to make a stop next month in Hershey. His new Album “World Peace Is None Of Your Business” is set to release sometime in June or July. It also features his touring band mates Boz Boorer (guitar), Jesse Tobias (guitar), Solomon Walker (bass), Matthew Walker (drums) and Gustavo Manzur (keyboards). From truly humble beginnings, born to Irish Catholic parents in the UK, to widely acclaimed musician and author…he had his professional music start as a singer with Slaughter & The Dogs during a brief period before publishing two works: The New York Dolls and James Dean Is Not Dead; Exit Smiling would not be published for at least another decade. His memoirs titled Autobiography, became one of the fastest sellers in the UK after its release in October 2014. Evidently, the British version is the best and uncut version to read.